2.5 Minute read. This 3 part series will help you to uncover the benefits of pre-planning can offer you and your family- logistical, financial, and emotional. 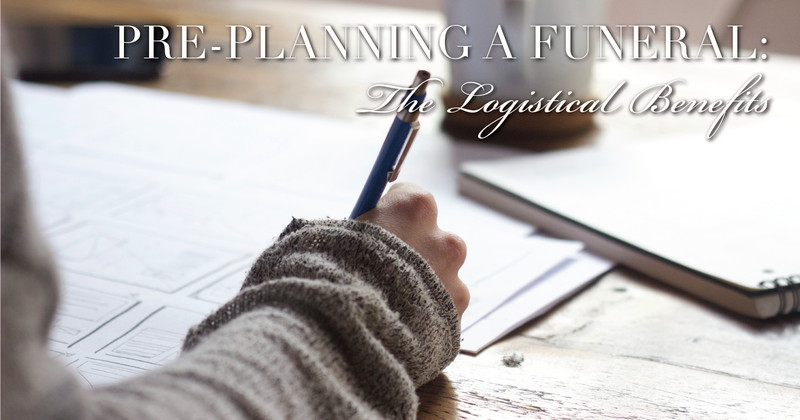 This first post will cover the logistical benefits of funeral pre-planning. In a previous post, we covered the basics about what is funeral pre-planning and who can benefit from pre-need arrangements. To recap, funeral pre-planning is making financial and/or logistical arrangements BEFORE there is an immediate need. Additionally, ANYONE can create a set of pre-need arrangements to the degree that serves them best. Now that we’ve brushed up on what pre-planning is and who is eligible for it, what are some specific benefits of pre-planning? Let’s take a look at how making pre-need arrangements eliminates logistical burdens. Every life is unique and should be celebrated for the individual being memorialized. At Lake Ridge Chapel, one aspect we pride ourselves on is our Signature Services. We have multiple burial and cremation service packages to choose from, a wide variety of caskets and urns available, options for personalized stationery, caterings and more - all designed to provide you with options to make the memorial service special and unique for you and your family. However, the downside of all these wonderful options available is that it can feel like there are A LOT of choices to make, which can feel overwhelming, especially if you’re planning in the moment. Pre-planning helps to eliminate the stress of time-crunched planning and can create greater opportunity for customization. Both of these benefits serve a greater purpose of making sure the memorial service is one that everyone can feel confident and secure in, knowing that you are being represented as the individual you are. While some people will enjoy and find security in getting the logistics organized ahead of time, others are unable or uninterested in participating in their own funeral planning. We get it - it can be a tough topic and not everyone is up to making these decisions. Additionally, elderly parents, terminally ill family members, or dependent adult children all probably need help to create a funeral arrangement plan. These scenarios are another example of how making pre-need arrangements can be helpful. By pre-planning, you’ve got extra time to plan, consult family members, and make appropriate decisions in the midst of complex family situations. And remember! You don’t have to make these choices alone! Our pre-need specialist will meet with you and/or any loved ones you want to include to go through options and create a service and memorial plan that works for you. One way to begin getting all of the decision-making under control is to work through our free Planning Guide. This guide will give you an idea of the decisions involved in funeral planning. By working through this guide now, you begin to sort through the logistics of who, what, where, and how in a stress-free environment, free of time constraints or pressure from others. Look at this guide as an easy first step. You’re not having to make any commitments or permanent decisions yet - you’re just taking a look and educating yourself to get an idea of what all is involved. Reading and processing this information in the comfort and privacy of your own home will help ease the stress of the unknown and allow you to process your planning in the way that’s best for you. Once you’re ready to make some decisions, our specialists are ready to meet with you and walk through the guide and the decisions you’ve made. At the end, all you’ll be left with the peace of mind that the work is finished. In our next post in this series, we’ll look at the specific financial benefits and funding options available to you. If you have any questions or need help downloading the guide, contact us and we’ll get right back to you.